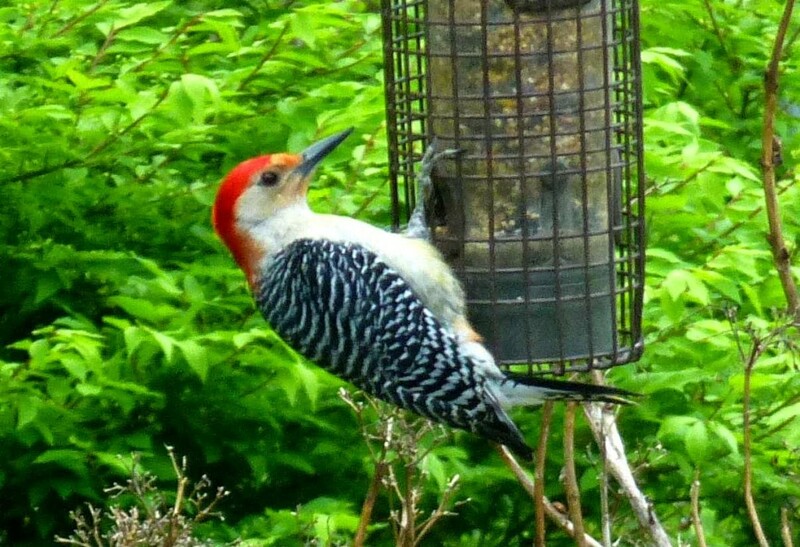 An occasional visitor to the seed/suet snack bar at the Inn on Mill Creek B&B, the Red-bellied Woodpecker is a year-round resident of Pisgah National Forest in western North Carolina, and is our November 2014 bird in our 12 Months of Birding at the Inn blog series. Red-bellied Woodpeckers love the woods, and with hundreds of thousands of acres of National Forest in this area, it enjoys a lot of elbow room. We do see this beautiful medium-sized woodpecker at the feeders from time to time, although he doesn’t like an audience and most photos are taken through the window from the inside. Red-bellied Woodpeckers like to build their nests in holes that they’ve dug out of trees. Many times, they choose dead trees for their homes, but they will also nest in fence posts. They do have a “nest nemesis” — the European Starling — who tries, often succeeding, to take over Red-bellied Woodpecker nests. While you may see Red-bellied Woodpeckers at the feeder, its diet mainly consists of insects, including spiders. But it does eat acorns and other nuts, pine cones and berries. If you put peanuts out in warm weather months, or suet when it gets cold, you may make a friend in the Red-bellied Woodpecker.